White House Historical Association (WHHA), founded by First Lady Jacqueline Kennedy in 1961, is a private, nonprofit organization with a mission to protect, preserve, and provide public access to the rich history of America’s Executive Mansion and maintain its legacy in the 21st century. The world has changed since the WHHA was founded, and so has nonprofit development. We were approached by the WHHA in 2012 to create an interactive historical experience for its digital presence and lead an ecommerce strategy in an ongoing capacity to generate sales to augment the association’s nonprofit funding. The WHHA every year creates a unique Christmas ornament; we needed to maintain excitement around that yearly launch by upping the historical and educational aspects of the WHHA’s shopping experience. Who doesn’t love to gift, especially around the Holidays? 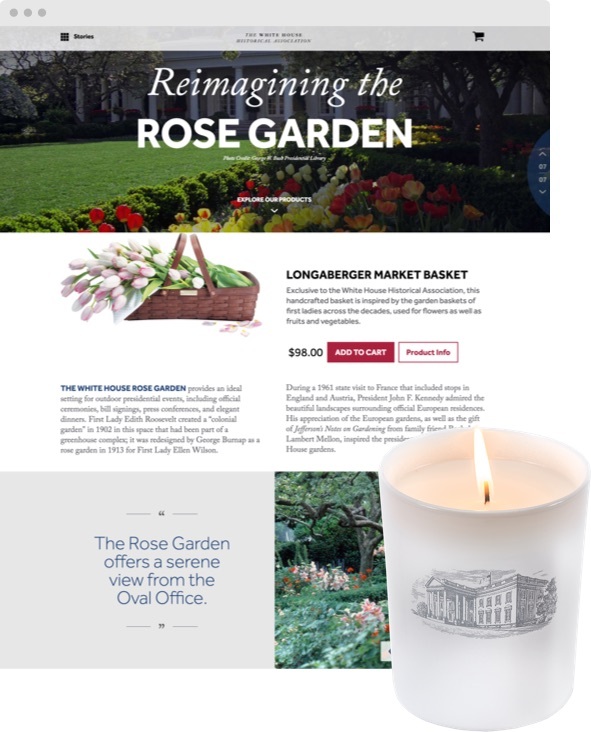 We knew we needed to create a product strategy around diversification, one that leveraged the popularity of the famous White House ornament, to inspire shoppers to buy other WHHA products. Bringing history into the present can be a complicated proposition. We knew we had to develop a digital and technical solution that allowed for an intuitive shopping experience while integrating seamlessly with a legacy ERP software. 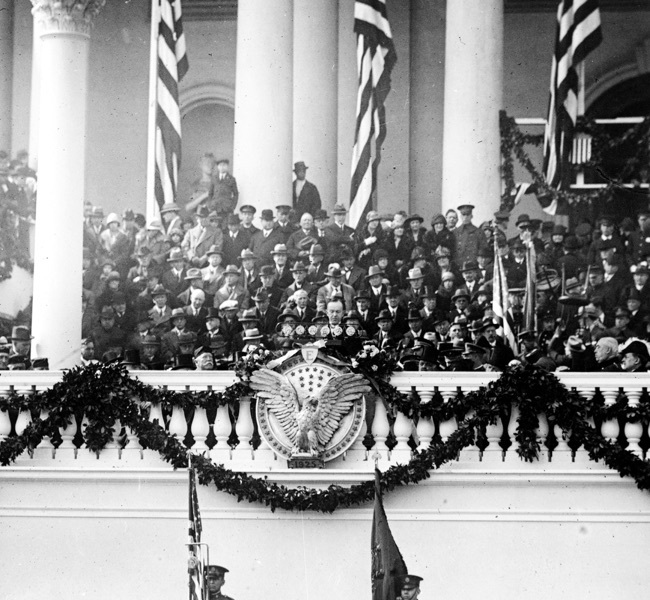 Our country’s history is a point of pride. 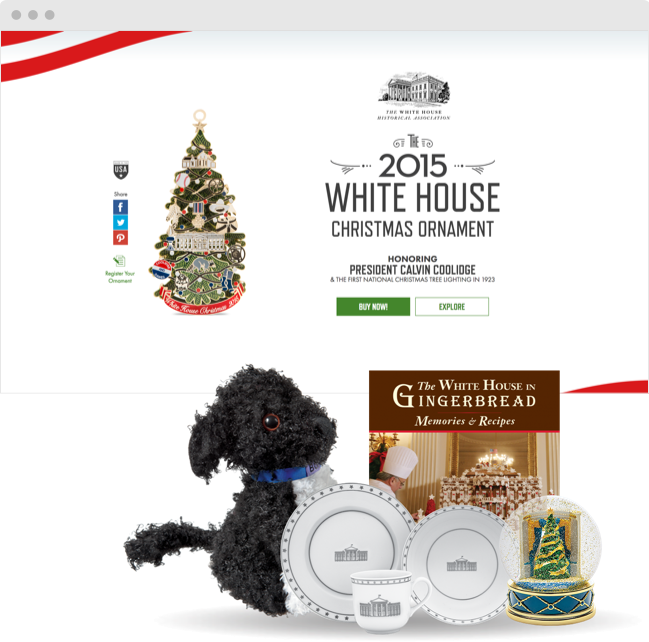 We wanted to honor the White House’s legacy by creating an digital outpost that felt inspiring and educational, and an organization Americans wanted to support through shopping.We created an ecommerce website that brought history to life, and highlighted the WHHA’s annual Christmas ornament. To continually expand the WHHA’s revenue, we use ongoing metric analytics focused on ROI to create new successful sales strategies. To expand sales, we looked at the WHHA’s existing customers and their buying habits and interviewed the WHHA’s own historical personnel in order to understand the best way to tie in the organization’s rich history into the user experience. We also analyzed the existing site’s sales and the WHHA’s in-store sales data to develop a tailored product strategy. The WHHA had a clear need for us to fill: driving ecommerce sales. We quickly realized that the Christmas ornament was pivotal to drawing interest in the WHHA’s other product offerings. 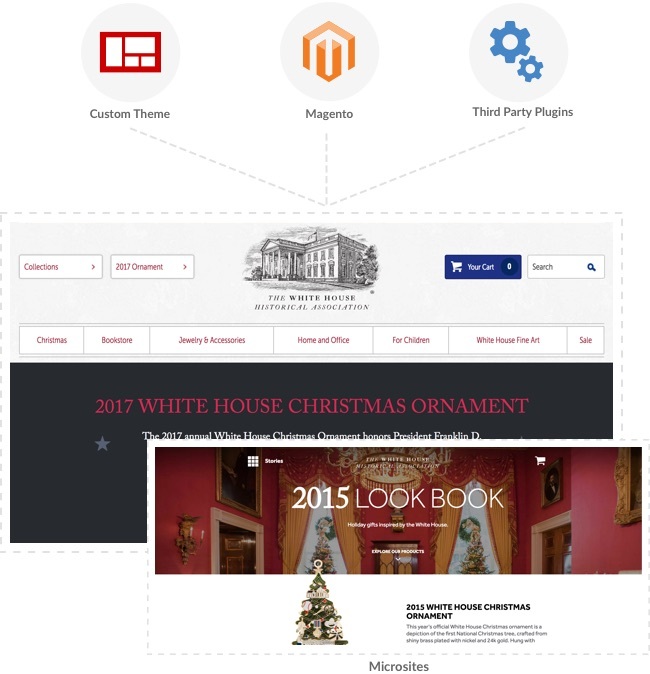 So we focused on the user paths navigating through the ornament pages and developed an experience infused the White House’s history to compel shoppers and increase shopping conversions. To keep the WHHA looking forward, we dig deep in our ongoing analytics reports to continually improve the user experience. 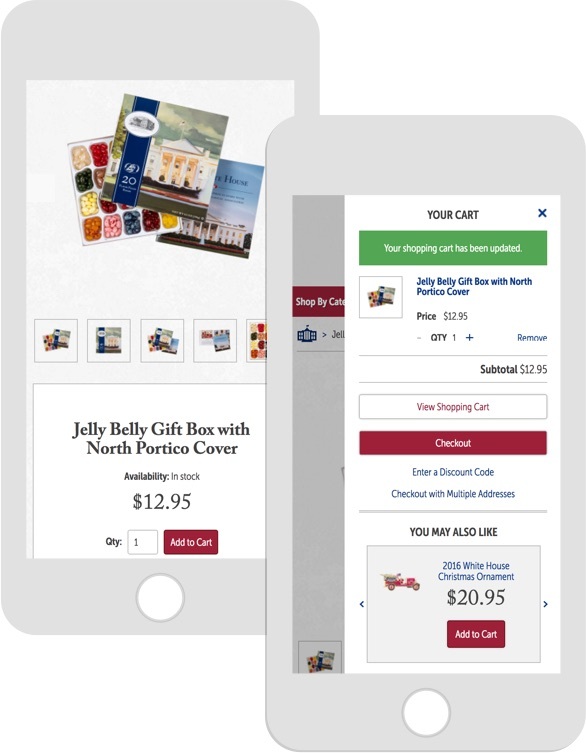 We look at how shoppers use the site, what products get added to the cart, reminders for when a product is left in the cart, and even developed a “related products” strategy to entice shoppers. Both the WHHA and the site’s data reiterated that the Christmas Ornament was its key signature product. 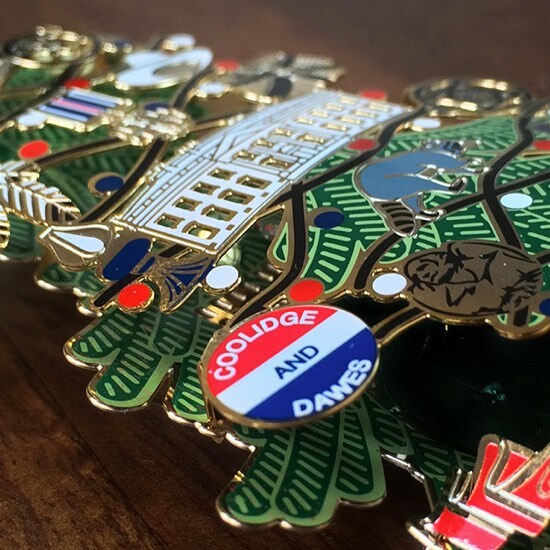 With a different president honored each year, we wanted to bring that president’s legacy to life. 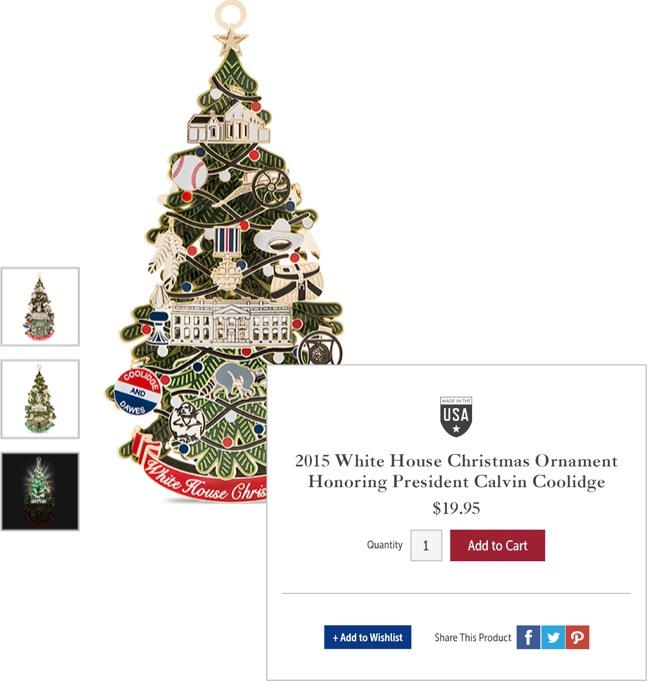 So, we created a microsite for the 2015 Calvin Coolidge ornament where we built a historical journey through the ornament's features, complete with scroll-over facts and figures and the option to illuminate the ornament itself. We rounded out the shopping experience by creating a tight technical integration with Magento and the core ecommerce site which makes the checkout experience frictionless and easy. Before there was digital, there was history. Every year the WHHA produces a printed look book that highlights some of its best products for the holiday season. While beautiful, the printed catalog can only deliver a one-way experience. So, tasked with bringing the Look Book to life in the digital space, we created an online experience where customers could take deeper dives into historical elements including archival images and video footage associated with various products. As part of elevating the WHHA’s shopping experience, we had to create a tech solution that dealt with quite a few parts. First, we integrated a highly-customized Magento back-end with the WHHA’s existing legacy ERP. Then, we created and integrated microsites for the Christmas Ornament and Look Book directly with Magento’s checkout in order to create a seamless buying experience. We also had to take measures to meet the requirements of strict PCI compliance, devise a new shipping strategy and optimize the site for wholesale capabilities. In addition to their website, the WHHA has a unique in-store experience where history is a key element of the sales process. Kiosks accompany the products so people can learn more about the historical context. Using Watson Personality Insights, we could ask for a customer’s Facebook account and analyze the content. It would create enough insight to perhaps alter the information at a kiosk and provide a more relevant experience back to the user. See our O3 Moods project below for an example of how we’re experimenting with this technology.